AnaCon is a framework where normative texts are written in Controlled Natural Language (CNL) and automatically translated into the formal language CL using the Grammatical Framework (GF). 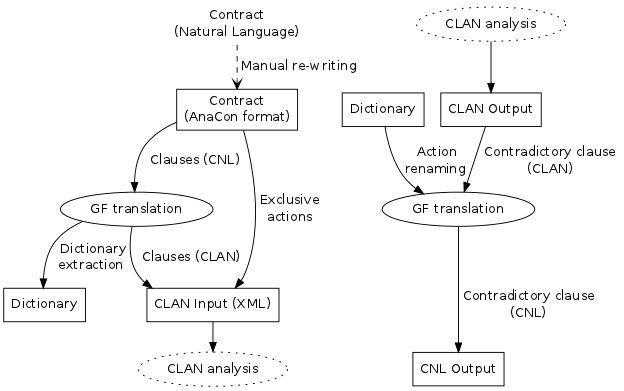 In AnaCon such CL expressions are analysed for normative conflicts by the CLAN tool, which gives counter-examples in cases where conflicts are found. Our framework uses GF to give a CNL version of the counter-example helping the user to identify the conflicts in the original text. A Framework for Conflict Analysis of Normative Texts Written in Controlled Natural Language, Krasimir Angelov, John J. Camilleri, and Gerardo Schneider, in The Journal of Logic and Algebraic Programming. Submitted 20 January, 2012. Everything you need can be obtained in this zip file. where dictionary.txt has been automatically generated from a previous invocation of AnaCon.py. Recommend that you use this in conjunction with grep.